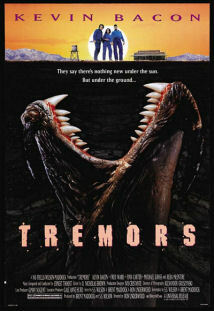 John Pavlich is back for another horror-comedy romp, this time with Kevin Bacon and Fred Ward vs sand worms. We revel in the B-movie cheesiness that works better than most A movies. We compare it to the sequels, Jaws, Maximum Overdrive, and other slasher and siege films. We speculate on the biology of the creatures and their closest living relatives. We analyze set-up and payoff. We mark the points of Val’s character arcs (two of them!). Attempting to download Tremors commentary. File comes up as 1 second in length. Just FYI.